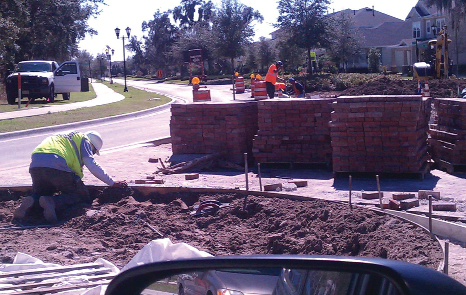 Workers break up and collect the bricks on a curved portion of FishHawk Crossing Blvd. to make room for the installation of three landscaped traffic calming median islands in hopes that motorist will slow down as they come up on the raised curb. 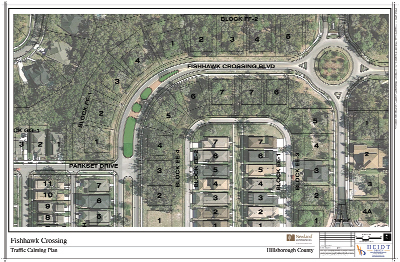 It is safe to say that when complete, the installation of three beautifully landscaped median islands along FishHawk Crossing Blvd., north of Parkset Dr. in FishHawk Ranch will make the neighborhood look even more attractive. The success of the Newland Communities funded traffic calming project; however, remains to be seen. According to Newland Communities Tampa North Vice President and General Manager Tom Panaseny, the project, which began in February, was due to new home construction on FishHawk Crossing Dr. as well as resident’s request to calm traffic and reduce speed on this curved portion of the road in the community. “The project is the result of residents concern during the spring 2010 development update meeting held at the Palmetto Club,” Panaseny said. The roadway continues to stay open to traffic with some delays with an anticipated completion in mid-March. Interestingly this section of FishHawk Crossing Dr. now requiring the traffic calming medians has been known for its share of incidents caused by speeding motorists, including two separate single-vehicle accidents involving the hitting of two nearby fire hydrants located along side the road and causing subsequent washouts or sinkholes. Panaseny explained that since the time of the public discussion in connection with the improvement, Newland has engaged Heidt Design and Alternative Street Design to provide recommendations for traffic calming west of the Ternwood round-a-bout. Since the project is a developer-funded improvement concurrent with new home construction, there is no cost to the Community Development District (CDD). As to how well these traffic calming islands will actually work to slow down traffic, Panaseny referred to the traffic experts, explaining that with landscaped islands and raised curbs, drivers tend to slow down. “The idea is that drivers go slower once they see a tree in the median and even more so as they pass by the raised curbs,” he said, while mentioning that he had spent nine years developing the Hunters Green community in New Tampa, where speeding was always an issue and the residents routinely blamed the construction contractors. Faced with the necessity to address the issue of traffic and follow up with the needed improvements, Panaseny emphasized that while no traffic calming was specifically built into the original design at FishHawk Ranch, it is certainly something the builder is considering on all new master plans. “On the new Circa FishHawk development, you will notice each main intersection is designed as a roundabout to slow traffic,” he said, while adding that all main connector roads in Circa are planned to have on-street parallel parking, which also encourages traffic calming. For more information about Newland Communities, please visit www.newlandcommunities.com.